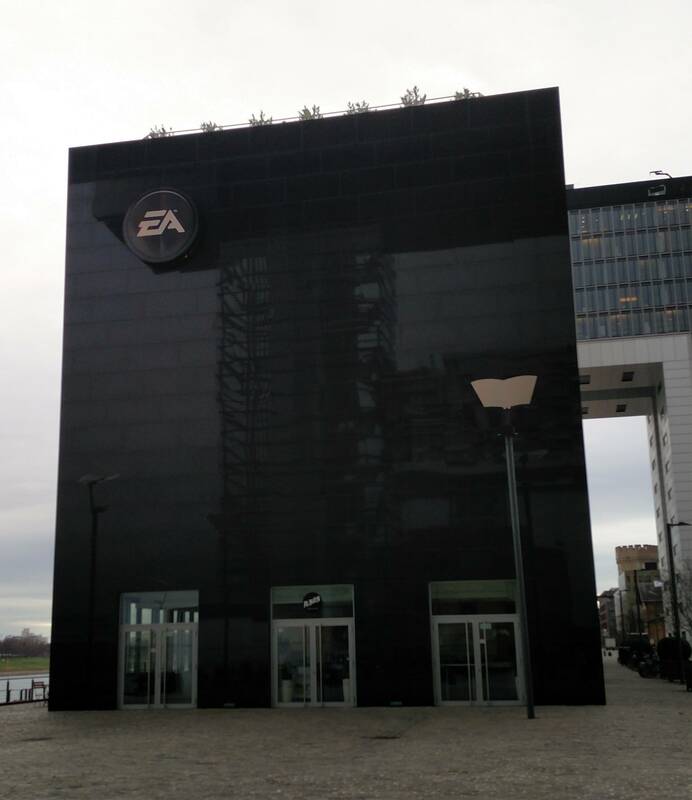 EA Germany invited quite a few fan sites to check out Get Together at their German headquarter in Cologne. Apart from a short Q/A with Graham Nardone through Skype, we had the opportunity to test the new expansion pack for 6 hours and take some screenshots home for you guys. 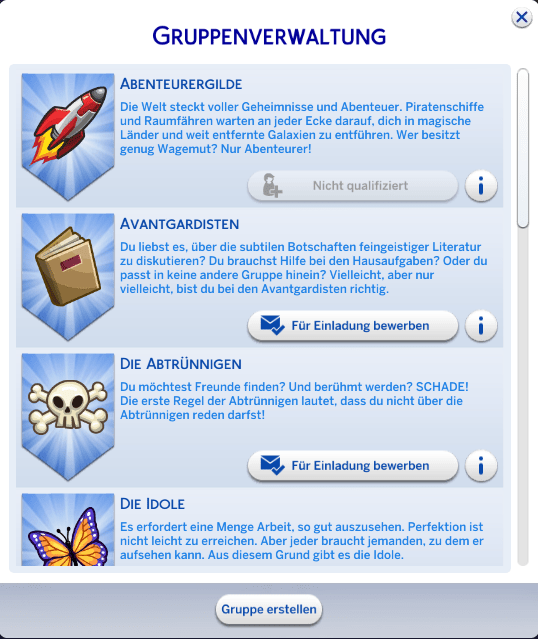 Be aware that all of these are in German since that was the language the game was installed in. My green Freezer Bunny accompanied me and checked out all the decoration and surroundings. 6 hours are long .. but also very short. We could not test everything and many questions remained without an answer. Despite of this we were able to get a good first impression. 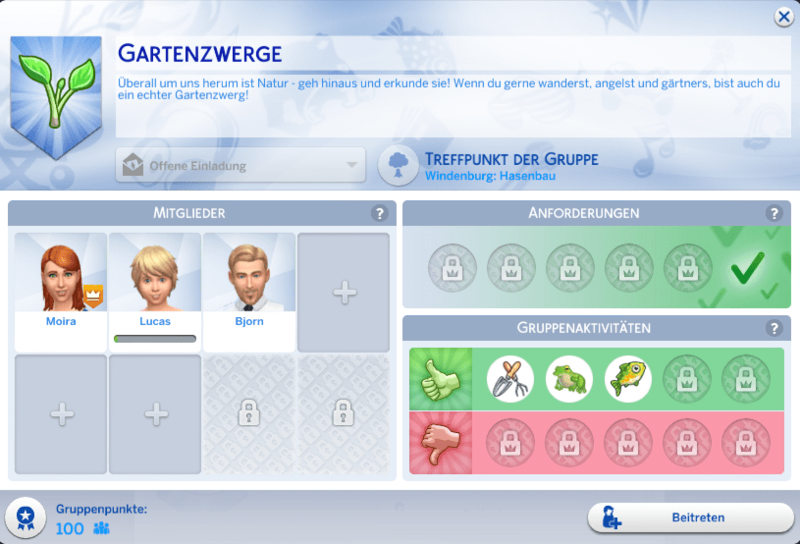 I shared computers with Dark_Lady from the SimForum.de and we split screen shot material. 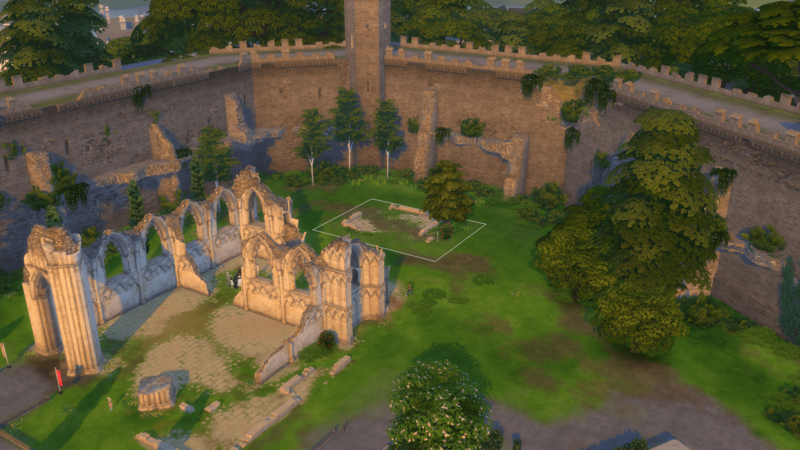 More pics from Windenburg itself can be found in her report. The release date for this pack is December 8th for the US and Dec 10th for most European countries. Check with Origin or your local retailer for details on your country. 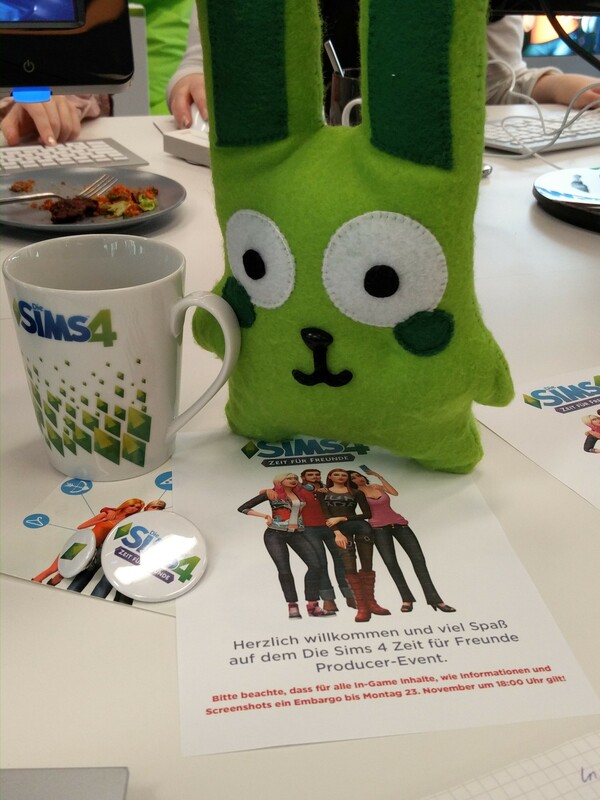 I want to express my thanks to EA Germany for the invitation and all the other participants for freely sharing information with everyone. Links to articles of other sites can be found at the end of this post. I’m only linking the German attendees. A list of other sites attending various events can for example be found at SimsVIP. There are certain words in this article that I haven’t translated since I don’t know the correct term in the English game. Other terms might not be the ones used in the game. I will correct these once the game is out. There’s a few things coming with the patch itself. This means you won’t need to buy the expansion pack to get these, just update your game. The world and the GUI had yet another face lift. The worlds are now colorful and everything looks a bit different. 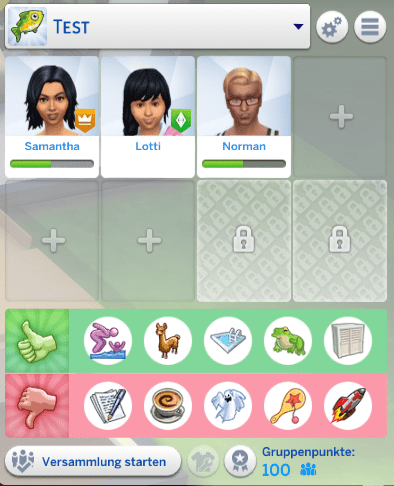 The icon for edit household was replaced with a different one and to confirm traveling and family change, you now have to click on an button in the lower right corner. I’m unsure if all the same interactions are still available but I couldn’t find the option to change the lot type on the map anymore that was there before. Live mode also got a GUI overhaul. Apart from the new button to manage the clubs, you’ll now find the options for the screenshot manager, taking screenshots and the videos next to the time display in the lower middle of the screen. In the upper right corner you now have the option to quickly switch between Sims 3 and Sims 4 camera mode. CAS has quite a few new things for men (about 40), women (about 60) and children (about 10 per gender). There’s a new aspiration which can be found under popularity: Leader of the Pack. There’s also two new traits for adults: Dance Machine and Insider. Insider is also available to kids. Windenburg consist of 27 lots in 7 neighborhoods. 3 have a special lot type that cannot be changed or placed yourself: The Ruins, the Bluff and The Garden Chateau. On top of that there’s now pool and café type lots. Windenburg has one pool lot (the other one you see on the map above was created by us) and two cafés. There’s also all kinds of lots with the existent lot types. There’s two empty lots and 4 unoccupied houses. The town itself is really lovely with lots of detail and a beautiful fountain. There’s different architectural styles and it has so much detail. 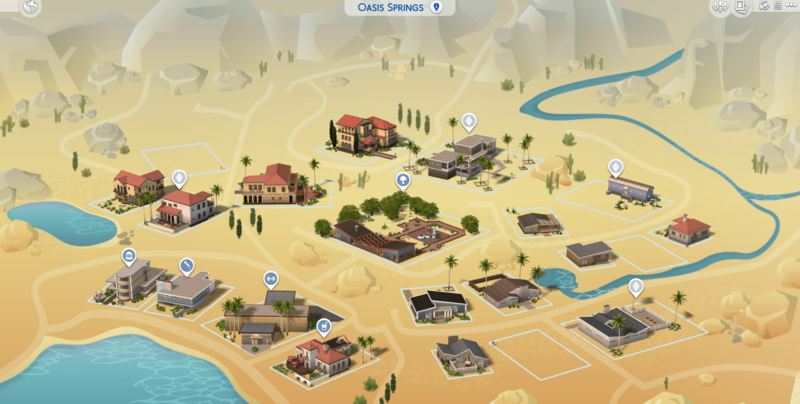 The special lots all have a – rather small – area where you can build but most is not editable, even with a cheat and you also can’t change the lot type. You can have a dance party on each of these lots which triggers certain objects to be placed (a lot like SIXAM). Sometimes you’re even invited to a party there by another Sim. A mansion which is haunted the Lord and Lady of the estate. There’s also a maze. Complete with a natural pool where your Sims can hang out and have fun. There’s also special bushes around to take a nap, to relieve yourself and for Woohoo. There’s also a bonfire where the Sims can dance. There are people talking of sightings of Emily amongst the sail boats when you enjoy the view from the bluffs. I hear there’s lots of partying going on on this lot. Cafés are a new lot type that can be placed in any world and that you can build yourself. 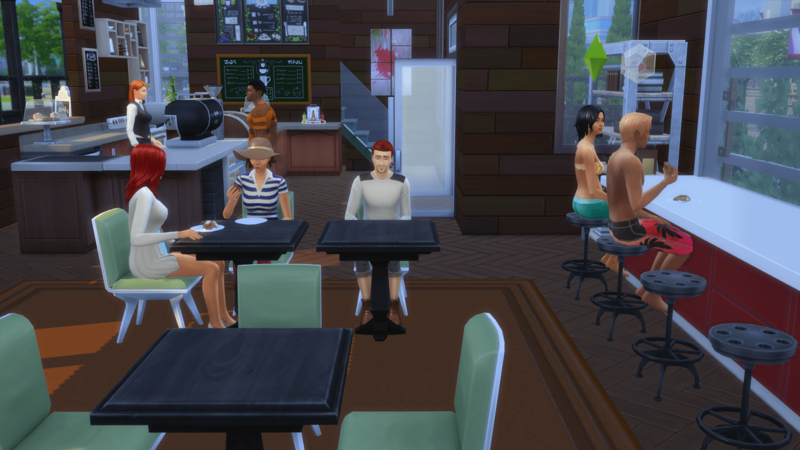 There’s an Espresso machine where your Sim can order food and coffee to go or to eat at the Café. They do sit together to eat if you tell them to eat in. There’s not a lot of food variety but there are quite a few coffee flavors to choose from, among them the Choice of the Batista. It won’t be possible to have your own Café but if you own Get To Work you can place the espresso machine on your retail lot and hire a barista (or man the machine yourself). It won’t generate any money for your store though. Pool type lots can be created without the expansion pack with the patch only. With the expansion pack there’s finally something for Crinrict to use for diving: Diving platforms. There’s three different types although two of them are meant for natural pools since they are more rocks than actual platforms. 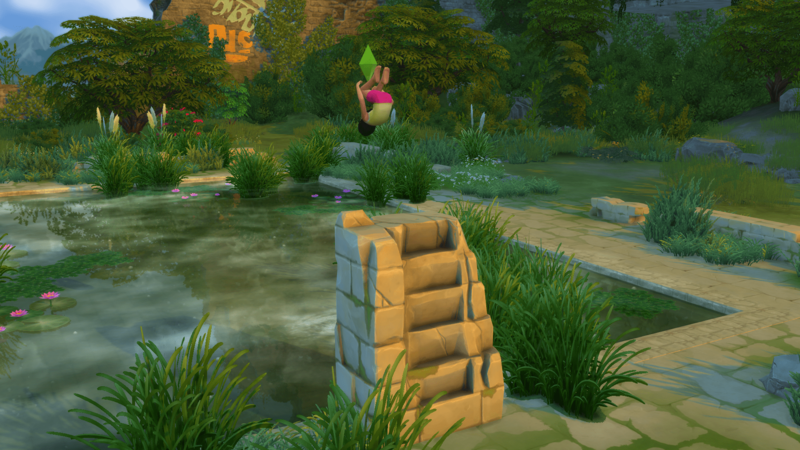 A Sim can choose between 4 groups of dives: cannon ball, back somersault, jumping and swan dives. There’s no diving skill. Failure animation are random – although they can be influenced by your Sims emotion. As known from other lot types, a pool lot has certain requirements that need to be fulfilled. You need to place a shower, a sink and a toilet, among other things. Buy and build mode has an unbelievable amount of new things. Someone counted 237 new buy objects, like glass dance floors which can be placed as 3×3, 4×4 or 5×5 object. There’s also lots of new stuff in build mode. More details on this can be found on other sites. The pool tool had an overhaul and you can now color the water in 6 different colors. Two of them will probably be also available in the patch, the rest comes with the expansion: TrÃ¼bsal, Pool-Pourri (mit vielen BlÃ¼ten), Glitzernd und Ultra-frisches Moorwasser. There’s also some jets you can place in the water as well as a new lamp that you can place at different heights in your pool. On top of that there’s pool plants, that can be placed on the water. I did not check out this part at all and can’t say anything about it. 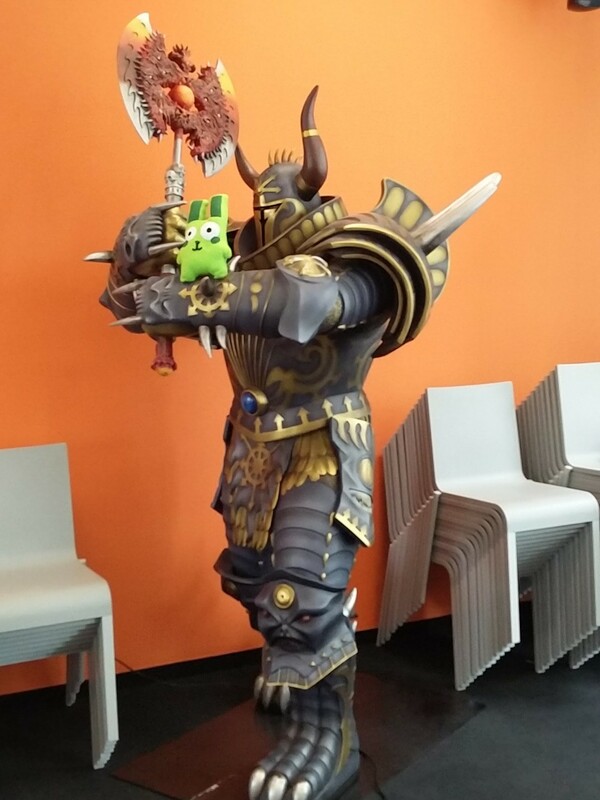 All I saw was a glimpse of what my desk neighbor was playing. Clubs seem to offer endless possibilities. There are so many options you can set that about any club you can think of is possible. We only had Get Together installed but as Graham confirmed in the QA-Session you can have club requirements that involve pack content. There are 11 pre-made clubs in town. These clubs can die out if you don’t actively add new members to it. There’s two reasons why an inactive Sims would leave a club: He doesn’t fulfill the requirements anymore or if he dies. Inactive Sims don’t join groups on their own but only if you initiate it. If a club doesn’t have any members anymore, it will be replaced with another (not identical) one. The player can create as many clubs as they want. They need to be filled manually though. Existing clubs can be edited but only if the active Sim is the leader of the club. 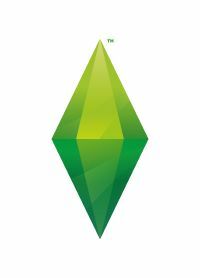 Inactive Sims can be invited by the leader to join the club or also to leave it. Requirements need to be fulfilled though. This also works through the club menu but only if the club leader is the active Sim. Active Sims can request to leave the group. We tried what would happen if the leader left the club. It worked without a problem but after doing so we didn’t get to pick a new leader but a random one was assigned – an inactive we had accepted in for testing purposes. It now became a bit difficult because we were no longer in power over the group and could not ask anyone in or made them leave. Only option was to change active families and make the new leader leave as well. If you’re not happy with the leader, you can also ask him if you can take over the club (you’ll need a good relationship) or you can talk to the other members and try and overthrow the leader. If you decide to make a club on your own then you need to make a lot of decisions. You can have 2-8 members in a club. At the beginning there are only 6 slots though. The extra spaces can be unlocked with club points. If you choose to make your club open invitation any active member can be come part of the club. If you make it invitation only the leader needs to invite them or you can ask the leader to become a member. The meeting place lets you specify where the group usually meets when you start a meeting. This can be a specific lot, a lot type or none at all. Each group has activities they like to do and others they despise. You can choose up to 5 activities each. There’s 9 categories to choose from that go from eat and drink to mischief and chaos. There are also special child activities like make homework, play in the dresser or similar things. Positive and negative activities only have influence while you’re in a club meeting. If a group member does a negative activity the normally transperent group indicator turns red and the other group members can scold the offending Sim. Requirements are mandatory and only Sims fulfilling them can join a club. If a Sim no longer fulfills a certain requirement they will be automatically removed from the club. The following categories exist and you can check multiple options per category. If you do activities while in a club meeting, you’ll get points which you can exchange for advantages for your club. 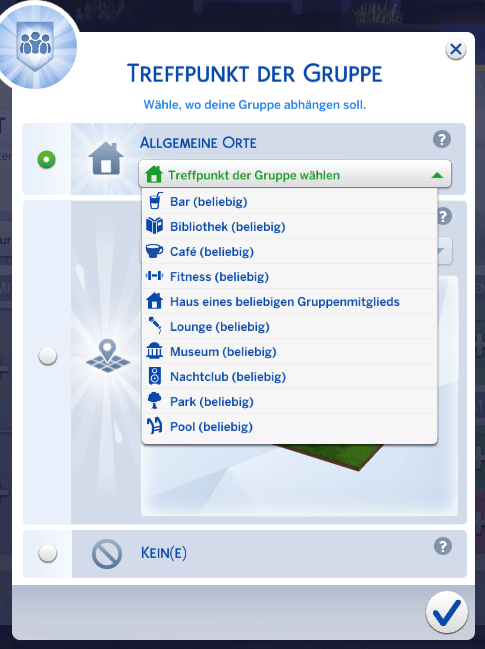 There’s special hand shakes, enlarging the group from 6 to 8 members, social bonus, skills, certain emotions, management (contains of night fever party that lets the Sims party all night and network groups that gives members a boost while working) and clothing and decoration stuff. Under decoration there’s a special club door which you can use in your club house. Only members of the group can then enter. Members identify themselves with as special knock. You can set fixed times for your meetings but if your active Sim goes to a lot that is the meeting point of a club, chances are high that the club is actually meeting there. I’m really looking forward to two things: The patch and the diving platforms (yeah, I know, no surprise there). 64 bit was something I wanted from the start and I’m really happy that EA/Maxis decided to give it to us. I also like most of the changes they made to the GUI (choosing a family and traveling does need more time now since you need to move the mouse pointed to a different place on screen) and the new maps are really pretty to look at. Each time I read that parties are the central theme of this pack, I have to disagree. It is of course an aspect that is covered by the new party type and dance and DJ skills but the clubs are mostly about socializing. You can have a sports club, a cracker-barrel that meets in the next pub. Study groups for kids or a chess club for elders in the park. Book works or the meeting of detectives if you own the Get to Work expansion pack. CAS and Buy/Build are not as important to me but I’m convinced that the builder will love all the new objects like the glass dome or the glass dance floor that can be used for different things. I also really liked the different pool colors. The expansion has a lot of depth since there’s so many possible combinations of groups you can create. There is something missing though – Turning them off completely. After installation of the expansion you will always have 10 clubs around your town which I think is rather high. I would have wished for more customization. I also find the way to add the club activities to your club a bit cumbersome. There could have been an easier way. After gamescom my expectations were very low and because of this I was surprised to see what the expansion actually has to offer. Windenburg along has so many details like none of the other worlds and invites you to walk around and explore it. It’s one of these expansions that need to be played to realize what’s really in there and for that the time was simply too short. I did not come across many bugs but one existing bug now really starts to be a huge bother. The book club has their meeting point an a locked room behind the Café. Books are being left by Sims all over the place for a while now and the Café is no exception. Mostly on the tables which leads to no one being able to sit down anymore. I don’t know the details on what they fixed yet but SimGuruDaniel has tweeted that the cap for the number of Sims in town is getting raised and SimGuruJill has kindly let us know that the musical chair bug is supposed to be fixed – I still did see one Sim switch places though when it was uncalled for. Another bug I checked upon is the stuck highlight for activity items in buy mode and that seems to be fixed.